bl.uk > Online Gallery Home	> Online exhibitions	> Asia, Pacific and Africa Collections	> Bankoty group, Bombay. 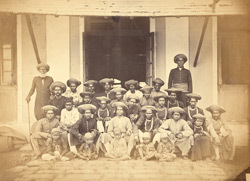 Portrait of a large group of Bankotis, or servants, taken by Hurrichund Chintamon in the 1860s, from the Archaeological Survey of India Collections. This photograph was shown at the 1867 Paris Exhibition. The Bankotis are defined by Edwardes as a group of hereditary servants from the Konkan, 'A certain number of Konkanis, known as Bankotis, are employed as menials in Hindu households and are somewhat highly paid, their wages having risen by 50 per cent and more during the last thirty years. In spite of this fact, however, they evince a tendency to relinquish domestic service in favour of employment in mills and factories' (S.M. Edwardes, 'The Gazetteer of Bombay City and Island', 3 vols, Bombay, 1909, vol. I, p. 214). The Bankotis are pictured here in front of the verandah of a Mumbai house; some of them are wearing livery.